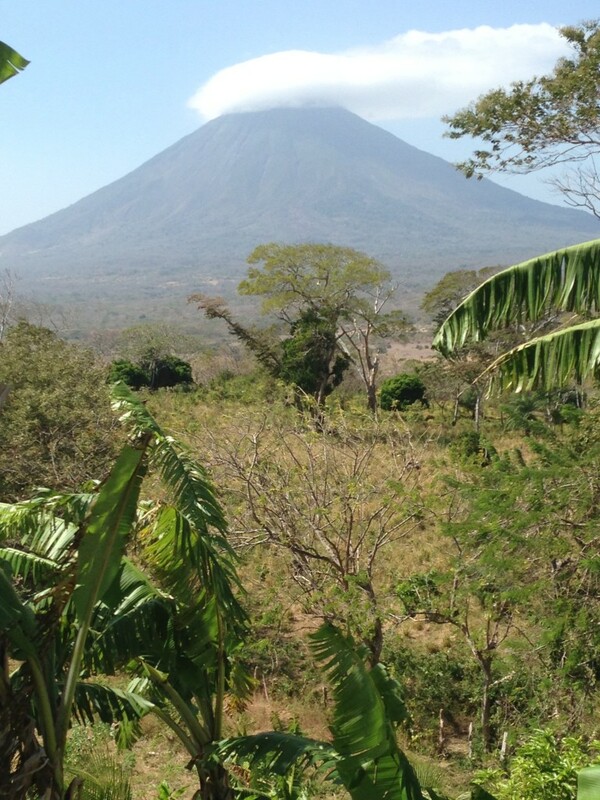 We have been on Ometepe Island at a Workaway site since Wednesday, February 17. This brain fart was written in the days after we arrived and relates to the time from arrival to Sunday, February 21. It is only being posted now, on Sunday, February 28, because Internet connection on the island is slow, and as the Emperor says, "Resistance is futile." So I don't even try.La Isla de Omotepe is an island in Lake Nicaragua, also known as Lake Cocibola, which scientists say was formed when lovers from warring tribes committed suicide to find peace together and the heavens cried the valley full as the princess lay back in death. The breasts of the princess are the twin volcano peaks that dominate the island - Concepcion, an active caldera which last erupted in 2009, and long dormant Maderas. Crossing Lake Nicaragua on the way to Isla de Ometepe with Vulcan Concepcion looming in the background. The people shadows that you see on the back of Wesley are Coconut and me. We took an hour long ferry ride to the island across Lake Nicaragua so we are trapped like a horse to a cart. If Concepcion blows we’ll be roasted like coffee beans - all the way through. The lake is as big as an ocean and has sharks in it, which gives credence to the theory that other scientists have that this area was once part of the Pacific before seismic activity raised the spit of land that became the rest of Nicaragua and cut the lake off from the sea. We came to the island to provide volunteer labor at a farm owned by a woman from New York named Maria. According to Workaway, the website where we found this opportunity, there is a lot of farming happening on the island, but before we left the mainland Maria told us to stock up on food because fruits, vegetables, and eggs are not readily available - so I guess there will be plenty of dope for sale because all these people farming must be growing something. 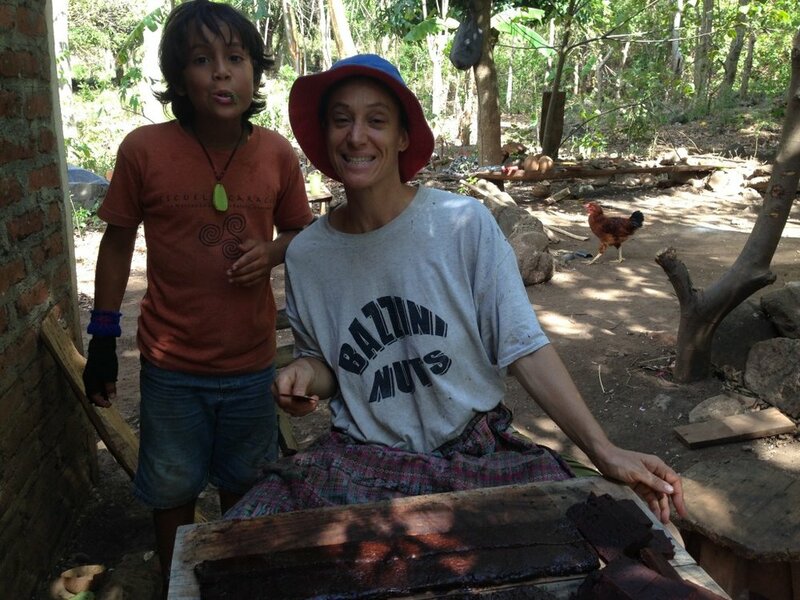 Maria, an American living in Nicaragua, and her son Angelo. J and Angelo immediately went off to play baseball in the leaves and Coconut and I settled down to peel a big bowl of roasted cacao beans so that Maria can show us how she makes the chocolate which she sells around the island. On Thursday, Angelo and I hiked a few kilometers up the mountain from the farm to an intentional community set on a gorgeous point of land across from Concepcion and with a view of the lake on both sides of the island and sold almost $40 worth of chocolate at $1.50 a bar to a bunch of young people from around the world who are trying to figure out who they are by walking around naked, doing yoga, and taking workshops about transcendent horticulture. I watched them do their thing while Angelo went for a swim in the pool - which had about six inches of water in it - and I think I can help them figure themselves out; they’re a bunch of horny kids who like chocolate and who need a course in pool maintenance. Concepcion volcano, the view from the nearby intentional community. We spent the rest of Thursday at the farm - J and Angelo continued their wiffle ball game in the dirt (it’s hard to call it soil) and R, Coconut, and I sorted about 10,000 beans so that Maria could soak them and cook them up for Angelo’s birthday party on Friday. As part of our cultural exchange program, R, Coconut, J, and I threw the stones and bad beans that we culled at Angelo as he rode by on his bicycle because fun is universal. After sorting out stones and bad beans from a several bowls of dried beans, the reward was using Angelo as a target. J has lately developed an almost paralyzing fear of things that bite - ants, spiders, and scorpions - and had a sort of meltdown on the way back to the van for the night. He spotted a scorpion on the trail and another as he stood on a bench waiting for us to do something about all the ants swarming outside Wesley’s slider door. A colony of tiny ants - sugar ants, somebody called them - has made Wesley home for the last few months. They haven't really been a problem because they don't bite, and recently a gecko lizard has also moved in. That solved our ant problem for the time being and it’s nice to hear the lizard chirp early in the morning as we lay in bed. J is happy because he always wanted a pet - he named it Chirpy. The good thing about piglets near the van is that they eat the bugs, which J loathes more than anything. Since we’ve been at the Ometepe Island workaway farm, there hasn't been a lot of farming going on, but a lot of preparation for Angelo's ninth birthday. On Friday we enjoyed a waffle breakfast that was more like a waffle lunch because cooking one waffle at a time on a wood fire takes all morning and then we went to the lake for a swim and a game of baseball on the beach (baseball is the most popular sport in Nicaragua) with the locals - of which Angelo is one; he can tie a great knot for a hammock and knows which nuts we find on the trail are edible. 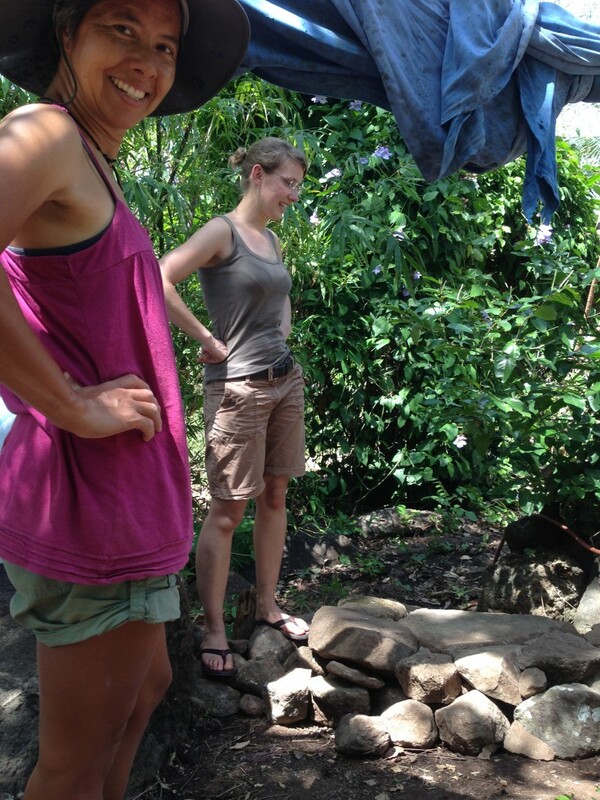 R and fellow Workaway volunteer, Imke, admire their work. They made a floor for the open-air shower stall by laying stones gathered from around the farm. It seems like everyone on the island has hiked one of the two volcanoes, so me not having done it is like I’m the forty-five-year-old virgin. On Sunday, however, I joined the ranks of those in the know - but it’s not one of those things that I want to do two or three times a day. While I don’t think it was quite that bad - the mile long hike up the nearly vertical slope that took nearly four hours in a windstorm that blew the snot off the tip of my nose did entertain with several types of terrain: cow path, loose gravel, forest, scrub land, exposed rock. I admit that I wondered more than once just what the heck I was doing up there. When we finally reached the summit after crawling the last 100 meters on hands and knees, the look into the crater was disappointing. It was like looking into a cloud bank. Concepcion Crater - the view was underwhelming. On the way back down, when I wasn’t thinking about how much my legs hurt, I thought about why anyone would climb that volcano when it is always cloud covered and you are almost guaranteed to see nothing. Is it in the hopes of seeing something cool? Is it to do something few others do? (Most visitors to the island climb Maderas, which is supposedly easier to do, but the exit point is at the hotel parking lot where we are camped and no one I have seen come out of the trail looks like they are ready for a game of bridge.) Or is it just the challenge of seeing if you can do it? I don’t know. I also got thinking about Maria, and why she chose the life she has - hoping to make a go of a farm that needs a lot of work while living in a concrete rectangle on dirt floors and with no electricity and cooking outside on a wood fire with no road to her house so everything in it she carried there. I mean, we’ve all probably thought about having to carry our bedside table from the bus stop through a banana plantation to our room, but Maria actually did it (ed. note - check to see if Maria has a bedside table.) On the one hand, it’s like, “Wow! This is a dream come true.” But on the other hand, it’s like, “It would be nice to not have to chase chickens out of my bedroom all day.” I don’t know. Maybe next week I’ll have a better idea.